They’re a slightly quirky, spandex-clad, early-to-bed/early-to-rise bunch. They shamelessly strip in the locker room, flaunt flotation belts, and “lift” water weights. You know I’ve blogged about the people you run into, but now let’s delve into a potentially deeper degree of workout crazy. Pool people. Running and swimming are both generally accepted and recognized as "normal," but pool running is in its very own league of odd. From what I can tell, pool people fall into 5 major categories. (And when I say “pool people,” I’m referring to non-swimmers who use the pool). 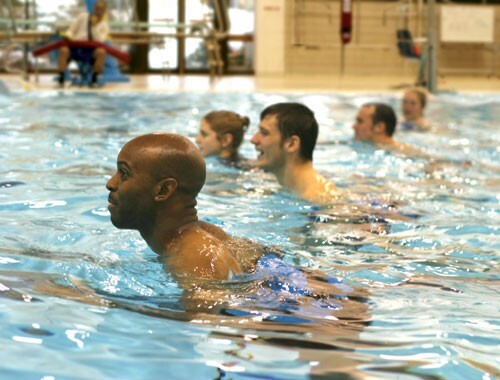 These people are in the pool for a specific purpose – to get a workout. Runners usually aqua-jog only when absolutely necessary (read: injured), but there are a growing number of people who incorporate pooling into their weekly training schedules to avoid overuse and pounding problems. In general, runners tend to be polite, aware of those around them, and friendly (I might be biased, since I count myself a member of this group). Silly-looking? Yes.But don't be fooled, below that bobbing head an intense workout is occurring. These people are understand the dynamics of aqua-jogging, they just do it slower and more leisurely than the “intense runners” out there. There’s a nice sense of community when runners encounter members of their species in the same unfortunate predicament. What are you in here for? is a common question, as if the pool is a penitentiary. You can meet great people, but beware of the Chatty Cathys! Unfortunately, the very nature of a pool dictates that there is no escape – your only option is to adjust your pace so that you don’t end up next to an unwanted friend. Yes, despite the fact that 80s babies are now well into their 20s, water aerobics is still a thing. And a lot of people do it! 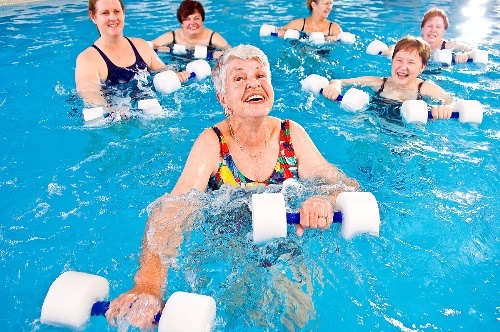 Water aerobicizers are friendly and welcoming. They are clearly the matriarchs and patriarchs of the “water walking” lane, but happy to share with any polite person who comes along. The demographic tends to be older, heavier, and most likely wearing some sort of colored/printed swim cap. It’s mostly women, but you’d be surprised by the number of men who get in on the action. I can’t quite figure these people out. They’re in the water. Sometimes they wear flotation belts, and sometimes they carry water weights. But I can’t tell what they’re doing. They’re not quite swimming, but not quite pool running. Imagine a little kid playing in the pool. Now play the mental video back in slow motion. That is what these people look like. Maybe they just like being in the water? This category is the gray area between poolers and swimmers. I understand that beginners aren’t good enough to go in the swimming lanes, and I do support everyone learning how to swim...I just prefer they do it when I’m not around. I think of them as aggressive and especially splashy floppers. And there you have it, the people of the pool. Next time you're in any kind of aquatic facility, take a glance at the periphery lanes to see what I mean. And for those poolers out there, am I missing anything major?